Here is your opportunity to interact with the greenhomebuilding.com panel of experts. You are invited to ask ONE question of any of our distinguished panel. You can ask more than one expert, if you like, but please don't ask for more than ONE response of any of the experts, even over time. Please read the Questions and Answers that have already been published on the page that pertains to your question, before submitting your question...the answer may already be there! You can view the questions and answers for any given topic by clicking on the Q&A link in the table above. Also, please limit your question to their area of expertise, as defined by the category that they represent. If you would like more in-depth consultation with any expert, just state this in the space provided below and this request will be forwarded. Your question and the answer to it may eventually be published along with all of the others on the appropriate page of this website. Your name and e-mail address will not be made public, nor will this data be sold or otherwise transferred. Sim Van der Ryn is a recognized pioneer and expert in sustainable architecture and planning practices. 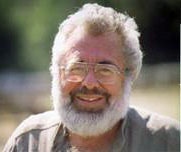 Through his varied experience as principal of several design firms, Professor of Architecture at the University of California Berkeley and California State Architect, he has provided countless examples of state-of-the art ecological design and has been a catalyst toward the current ground swell of interest and support for these practices. As President and Chief Designer at Van der Ryn Architects in Sausalito, he is currently designing a new generation of environmentally friendly buildings. The American Institute of Architecture designated his Real Goods Solar Living Center in Hopland, California as one of the nation's top 10 projects for Earth Day 1999. His current design for the West End Golden Gate Park Pavilion Community Center is the pilot project for the City of San Francisco's Green Building Program. Van der Ryn is author of several seminal books in the fast growing field of "green architecture" including Sustainable Communities (Sierra Club, 1986), Ecological Design (with Stuart Cowan, Island Press, 1996) and Geometry of Hope (manuscript, 2002). Jenny Pickerill (PhD) is a Professor of Environmental Geography at the University of Sheffield. She has been teaching on environmental issues, eco-building, and social change for many years, is a journal editor, has published several books and many articles and is also a guest lecturer at The Centre for Alternative Technology, Wales. She has built her own eco-house in Leicestershire, England from reclaimed materials. She has spent over a decade working with environmental activist and social change organisations, and co-edited a book on the self-build eco-homes. She is currently doing a research project on affordable eco-housing, having been awarded a travelling fellowship by the Winston Churchill Trust in order to improve approaches and practices to affordable eco-building. She is also working on a project with physical scientists exploring how best to help prepare rural communities survive climate change. She writes the Green Building Blog about low-cost eco-housing and continues to seek to improve environmental education at Universities, particularly ways in which we can incorporate practical learning into theoretical programmes. Kelly Hart is your host here at greenhomebuilding.com, and has been involved with green building concepts for much of his life. Kelly spent many years as a professional remodeler, during which time he became acquainted with many of the pitfalls of conventional construction. He has also worked in various fields of communication media, including still photography, cinematography, animation (he has a patent for a process for making animated films), video production and now website development. One DVD program that he produced is A Sampler of Alternative Homes: Approaching Sustainable Architecture, which explores a whole range of building concepts that are earth friendly. Kelly is knowledgeable about both simple design concepts and more complex technological aspects of home building that enhance sustainable living. He has even designed and built a solar-electric car that he drove around his neighborhood. 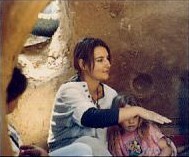 Kelly, and his wife Zana, lived for many years in the earthbag/papercrete home that he designed and built and that is profiled on the earthbag page. Jim Tolpin is a cabinetmaker-turned-journalist who has written a number of award-winning books on woodworking and home design. His book, The New Cottage Home (Taunton Press, 1998), is featured on this page. Jim has written a number of books on various aspects of woodworking, all published by Taunton Press, including Building Traditional Kitchen Cabinets; The Toolbox Book; Working Wood; and Built-in Furniture. Jim's most recent book is titled The New Family Home. In the course of researching and writing The New Cottage Home, Jim had the opportunity to explore small, unique houses from all parts of the country. All were filled with careful, yet sometimes quirky, craftsmanship and design work-- comfortable dwellings that set quality of place far ahead of quantity of space. Speaking more to his heart than his head, these houses awoke dreams of his childhood, dreams of living in a house in which he felt completely at home. Ken Haggard, formerly an architecture professor at California Polytechnic, is an architect and principal in the San Luis Sustainability Group. Since the late sixties, Ken has designed more than 200 solar buildings, from homes to large commercial and institutional buildings—as well as the first permitted straw bale building in California. An active member of the American and International Solar Energy Societies, he received the Passive Pioneer Award from ASES in 1999 and was made a fellow of ASES in 2000. His office and home—in Santa Margarita, California—are passive solar, off grid, and straw bale. With David Bainbridge, Ken wrote Passive Solar Architecture: Heating, Cooling, Ventilation, Daylighting and More Using Natural Flows, published by Chelsea Green in 2011. Paul Shippee is director of Colorado Sunworks and is a solar designer and builder. He was the founding President of the Colorado Solar Energy Association, and a teacher. Paul holds a degree in Civil Engineering, with a major in Structural Engineering from the University of Connecticut. He helped plan housing experiments in energy conservation with the U.S. Department of Housing and Urban Development, and designed and built the SunEarth House, which was the best-rated energy conservation, earth-sheltered home in a HUD-sponsored study. He holds a U.S. patent on a solar water heating system. Paul is currently living in a rammed-earth/strawbale home that he has designed as a personal residence in Colorado. His book, THE LANGUAGE OF SOLAR ENERGY: Heat Loss & Solar Gain for Buildings, is available from his website: crestonesolarschool.com. Janine Bjornson is a natural builder, practitioner and educator. She began her career in natural building when she trained with The Cob Cottage in 1996. Since then, she has taught over 65 workshops in Canada and the United States, from east to west. 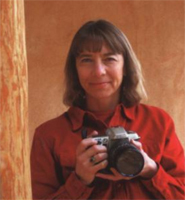 Her passion for building with natural materials bloomed out of her love for the earth, in conjunction with her concern for diminishing ecological resources and toxic buildings. As a result of this, Janine has devoted the last 14 years to immersing herself in the world of natural materials and the knowledge of how we can shape dwellings that are healthy, healing, inspiring, and beautiful. She has developed a penchant for natural paints, and plasters and loves the concept of “naturalizing” any kind of home. She loves to share this knowledge with others and this is evident in her enthusiastic teaching style. Janine has assisted in organizing 2 Natural Building Colloquia. She has presented at the Natural Building Colloquium in Bath, New York, Kingston, New Mexico, and Kerrville, Texas. She taught the hands-on natural building component of New College of California’s EcoDwelling program, and Dominican University’s EcoDwelling program. She lives in Sebastopol, California. www.claybonesandstones.com. Greg Nolan has been in the forestry business for 25 years. He started his career in Oregon, working for the US Forest Service. For ten years he worked as a fire fighter in the summer and did reforestation contract work in the spring and fall. He was recruited to leadership positions both in the Forest Service and working in the private contracting world. In 1980 he headed east two days before Mt. St. Helens blew her cork (was this a sign?) He settled on the back forty of the family farm in the Mississippi headwaters region of central Minnesota where he started Snowy Pines Reforestation. Since that time he has been immersed in building community around sustainable forestry and responsible use of our natural resources. He has worked with a variety of groups to accomplish this, including Audubon, The Nature Conservancy, MN. Dept. of Natural Resources, U of MN., Midwest Renewable Energy Assoc., Headwaters Forestry Co-op, Long Prairie River Stewardship Project, and hundreds of private landowners. He lives in a solar-electric home which he built from locally harvested materials. He likes the idea of working with the forest and it's products from seedlings to siding and flooring. He is interested in fine tuning our harvest methods to encourage natural regeneration of our native high quality hardwoods (especially Oak) and caring for the local White Pine Resource. He avoids the use of chemicals in forest management, believing we don't know enough about what is happening in our forest soils to apply such radical treatments. His forestry advise will reflect this philosophy. Bill Sitkin says, "At the heart of recycling, for me, is a great love for this planet and the awesome natural systems that support life here. I have always been a 'dumpster diver' and developed a used building materials and deconstruction business known as The ReStore in Crestone, Colorado. I look forward to your questions on anything about recycling materials or deconstructing buildings." Robert Riversong has created his own form of the Larsen Truss building system, and specializes in super-insulated houses. He teaches at the The Yestermorrow School in Vermont, and his classes have included: Efficiency by Design; Plumbing DeMystified; Math for Builders; Engineering for the Homebuilder; Hygro-Thermal Engineering: Moisture Mechanics & Management in Residential Construction; Tricks of the Trade; Thinking Like a Mountain; Foundations: Building the Base for Appropriate Construction; and Rigging, Rolling & Raising. From geodesic domes in the 1970s and a community land trust homestead program in rural Maine in 1981, Robert has worked as a project manager, trainer, and consultant for non-profit building projects from inner-city Boston to the hollers of Tennessee. He has focused on passive solar super-insulated buildings, with one of his design/build projects receiving a Citation for Excellence in a national energy/resource-efficient design competition. Robert has also worked as an outdoor experiential educator and wilderness guide, a ritual leader and rites-of-passage facilitator, and a spiritual midwife for people in transition. Kelly Hart, your host at greenhomebuilding.com, is an avid solar greenhouse gardener and has built many of them in a variety of climates. The most recent one he built can be seen on the Grow your Food page. Kelly spent many years as a professional remodeler, during which time he became acquainted with many of the pitfalls of conventional construction. He has also worked in various fields of communication media, including still photography, cinematography, animation (he has a patent for a process for making animated films), video production and now website development. One of the more recent video programs that he produced is A Sampler of Alternative Homes: Approaching Sustainable Architecture, which explores a whole range of building concepts that are earth friendly. Kelly is knowledgeable about both simple design concepts and more complex technological aspects of home building that enhance sustainable living. Kelly Hart is your host at greenhomebuilding.com. He and Rosana created a large pantry (about 150 Sqare feet) in their earthbag house, which can be seen on this page (above). Kelly has produced a video, titled Building with Bags: How We Made Our Experimental Earthbag/Papercrete House, which chronicles the adventure of building this house, and shows some of the making of this pantry. Kelly is available to answer questions about what he has done, or consult about other pantry or root cellar projects. Michael Black, who has designed three cohousing communities in CA, now also offers development and development consulting services through Community Life Development LLC. He is currently spearheading two elder cohousing communities, one near Austin and one on the northern CA coast, and is assisting an aging-in-place cohousing community in Austin, TX. Michael Black & Associates has been providing consensus-based community planning and architectural services to a wide variety of clients for over twenty-five years. Michael is now partnering with other architects, while focusing his design and community-building skills on aging-in-place and elder cohousing. Dan Chiras has been involved in natural and alternative building since 1994 and lives in an off-grid passive solar/solar electric home in the foothills of the Rockies. His house is built from straw bales, rammed earth tires, and numerous green building materials and is powered entirely by wind and solar energy. Dan is author of The Natural House: A Complete Guide to Healthy, Energy-Efficient, Environmental Homes, published by Chelsea Green; The Natural Plaster Book: Earthen, Lime, and Gypsum Plasters for Natural Homes (with Cedar Rose Guelberth), published by New Society Publishers; and numerous articles on natural building and sustainable design, which have appeared in Mother Earth News, Natural Home, and The Last Straw. Dan embraces a comprehensive systems approach to building that offers a wide range of benefits to people, the planet, and our economy. He will field general questions on natural building and offers consultation on project design and construction, as well as lectures and workshops on various aspects of natural and sustainable design and construction. John Connell founded the Yestermorrow Design/Build School in 1980 and the Yestermorrow Building Group Inc. (later to become 2morrow Studio in 1982.) He taught at Yale's school of architecture for five years after which he authored the book Homing Instinct: Using Your Lifestyle to Design & Build Your Own Home, McGraw Hill, 2000. Besides teaching he is currently designing green homes that tell "stories", design/building treehouses for handicapped children, and animating short films. 2morrow Studio puts into actual practice the design/build philosophy taught at the Yestermorrow School. A small design/build firm in Vermont, 2morrow Studio works with residential and small commercial clientele interested in integrated energy-efficient architecture using the latest green and sustainable methodologies. Besides architectural design, Connell is an experienced team builder, group facilitator and educational program designer. The Yestermorrow School teaches people how to plan, design, build or renovate their own homes. It is staffed by over 40 architects, builders and artisans from all over the United States who believe that the way to improve the built and natural environments is to re-involve people in vernacular architecture. Quentin Wilson and Associates, specializes in solar adobe design and construction. He grew up in the South Valley of Albuquerque, New Mexico where he watched adobe bricks being made. In the fifth grade, he made miniature adobes on cookie sheets in his mothers oven in order to construct house models for a class assignment. By age thirteen he made full-sized adobes in the back yard and ruined the grass. Later, he traveled a bit, went through the Army, and graduated eventually from the University of New Mexico with a major in physics, minors in math, chemistry, and education in 1970. After teaching high school two years and community college math for three more, Quentin moved into professional solaradobe construction in 1976 as the Project Manager and Instructor for the Sundwellings Demonstration Project at Ghost Ranch, Abiquiu, NM. He became a licensed general contractor in the State of New Mexico in 1982. He has been building homes and teaching seminars and workshops ever since. 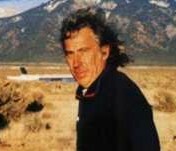 In the fall of 1995 he established and taught the full-time Adobe Construction Program at Northern New Mexico Community College. His website, quentinwilson.com, lists the course schedule and many other resources related to working with adobe. Kelly Hart is your host at greenhomebuilding.com, and has built his own home using the earthbag technique, which can be seen on this page. He has adapted the concepts popularized by Nadir Khalili and his "superadobe" building, by filling the bags primarily with crushed volcanic rock. This creates insulated walls that are similar to strawbale, except that they are completely impervious to damage from moisture, insects or rodents. Earthbags can be used to fashion either flat walls, curved walls, or can be assembled in the shape of domes that require very little wood or steel. Kelly has produced a video, titled Building with Bags: How We Made Our Experimental Earthbag/Papercrete House, which chronicles the adventure of building this house, and shows other earthbag houses as well. Kelly is available to answer questions about what he has done, or consult about other earthbag projects. 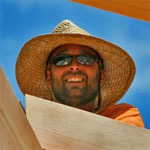 Rob Roy is Director of the Earthwood Building School, which has specialized in cordwood masonry instruction since 1980. Rob and his wife, Jaki, have built four innovative cordwood homes for themselves since 1975, including the Earthwood home where they have lived for over three decades. Earthwood is a 2400 SF two-story round, load-bearing cordwood home, earth-bermed and earth-roofed. Details of construction are in Rob's Earth-Sheltered Houses (New Society, 2006) and Cordwood Building: The State of the Art (New Society, 2003) two of fourteen books he is written in the alternative building field. Rob and Jaki have taught cordwood masonry in Earthwood Building School all over North America, as well as in Chile, New Zealand, Australia and Hawaii. They have helped scores of owner-builders with their cordwood projects, including homes, saunas and outbuildings. Earthwood has produced a 3.25-hour DVD on cordwood construction, which, with his books, can be accessed through the Earthwood website, or on the Cordwood page here. Rob is considered to be one of the leaders in the field of cordwood construction and earth sheltering. He does individual consultations at a flat rate of $75/hour, but answers questions here without charge. See also Earthwood Facebook. Brice Cochran has been working in the timber frame industry for over 14 years as a timber framer in the shop, project manager, and designer. He finished his own 3,000-square-foot timber frame home near Mountain Rest, SC while working in and on his timber frame design business Whetstone Designs and Timber Frame HQ. At the University of North Carolina, he studied Philosophy and Mathematics. He is an active member of the Timber Framers Guild and the Timber Frame Engineering Council. He is married and is the proud father of two children. Jose Garcia has been a landscape contractor for 24 years and has gravitated to doing a lot of rock work. He has built innumerable retaining walls of timbers, boulders, drystacked and mortared stone. He has built foundations out of stone and mortar and put rock veneer around the base of a straw bale building to raise the level of waterproofing. He lays about 20 tons of flagstone a year in patios and walkways. Over the last couple of years he has built a half dozen mortared flagstone staircases. In Colorado we are blessed with a wonderful red flagstone with great tensile strength that he uses to make benches. He tries to work with the stone's shape as it comes, and can generally lay out a patio with a minimal amount of cutting or chipping, and the benches are free form and distinctly shaped. Mostly He's out rolling boulders and flipping flagstone on a daily basis. Chuck Henderson is founder of fishrock studios a multimedia invention company located near Gualala, California on the rugged Mendocino coast. Among his eclectic creations and software projects is CONICS... a unique system of creating interesting shapes by bending plywood. Conics creates inexpensive roof systems made of plywood (hemp, bamboo or wood), where the plywood is connected following very precise rules so that the resulting structure is a concave and convex multi-conic shell. The plywood acts as structure, sheathing, and roofing. There are endless combinations of conics designs. The form is like nothing else in the architectural lexicon. If you are going to use wood to create a shell, this is probably the most minimal approach possible. Jeff Ruppert is a registered Professional Engineer in the State of Colorado. He has over 15 years of experience in the construction trades from laborer to general contractor to engineer, and he prefers to work on projects that will offer some aspect of reduced impact or consumption of our natural resources. 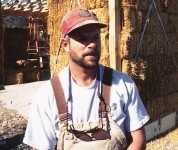 From early 1996 to late 1999 Jeff worked as part founder and owner of a straw bale construction company in Boulder, Colorado, called StrawCrafters. During that time he oversaw and participated in the design and construction of 11 custom straw bale homes and provided professional assistance on well over 50 additional straw bale and natural building projects. To date, Jeff has consulted on well over 400 straw bale and natural building projects around the country. He has given many presentations to groups, such as the local AIA chapters and he sat on the Structural Panel at the 1999 International Straw Bale Conference in Marin, California. He is regarded as one of the leading structural engineers in the field of straw bale construction, and continues to participate and expand the breadth of knowledge and understanding at the national level. Mark Moore graduated from Texas A&M University with a major in Agri-Business and minor in Economics. He has 25 years of banking and lending experience in all aspects, including home mortgages. He has done lending in Texas, New Mexico and Colorado and is currently Senior Vice President of Collegiate Peaks Bank in Salida, Colorado. Collegiate Peaks Bank is the largest home construction lender in the Upper Arkansas River Valley, where they try to make it easy for the borrower from construction to permanent. They place permanent mortgage financing with Affliliated Financial Group and Skyline Financial Group. They are the only bank in that region that will do financing on alternative housing. They currently have four offices, two in Chaffee County and two in the Denver area.